Promote offers by relating specific keywords to specific promotions, which can also be matched up with the relevant marketing material. This will allow you to see which are working best and which are making your target market contact you. An example of a customer who has used a similar approach to this is The Department of Work & Pensions, they used the keyword ‘BOSS’ followed by 2 letters either LF (Leaflet) NP (Newspaper) BB (Bill board.) This was a way of helping them assess which aspect of their marketing people read and responded to, once the campaign finished they could determine from their statistics which piece of marketing was the most popular. Use keywords for the different sectors within your business; for example a Law firm might have a selection of keywords such as Law, Divorce, Employment and Litigation. 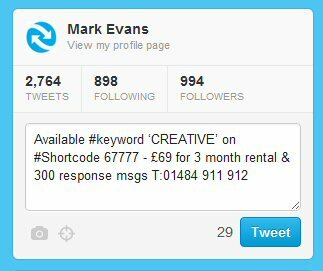 Once again the appropriate keyword can then be used on different advertising/marketing material. All the campaign statistics could go to the correct person who deals with this within the team making sure the enquiry process is handled efficiently. One of our customers Ramsdens Solicitors use this approach, they have Text LAW to 67777 and we’ll get back to you’ on their website which is any easy method for people to contact them and they can follow up accordingly. If you’re doing a radio and television advertisement then using a keyword is an easier method for the person to get in contact with you, you can easily capture the data of anyone that texts and you can send a reply text to inform them that someone will be in contact with them. This is much easier than having the phone ringing none stop and the person not getting through to a member of the team straight away. It is also a good approach if the TV or radio advert is played out of office hours and therefore there is no-one around to take calls. Keywords also work well to encourage people to opt in to your SMS Mobile loyalty program by adding the keyword to advertising and marketing material. This is an easy method for the person to opt in and a good way for you to build up your mobile database who you can then market to via SMS informing them of your latest promotions. Total Fitness have used this approach and also use a variety of keywords such as GYM which people can text in to receive information about the latest offers and promotions on gym membership prices. If you want to know more about how Total Fitness use our business text message service then read their Customer Case Study here. You could also use a keyword to build up your email database by encouraging people to text in their email address, you can then capture this data and add them to your mailing list. This is exactly how one of our customers ‘In N Out’ have used a keyword and they’ve found SMS to be a driving force in helping them reduce costs and an effective channel of communication, read their Testimonial on SMileS. Has this blog post got you thinking about starting your own SMS Marketing Campaign? We have a diverse range of available Keywords and Shortcodes available so why not give us a call today on 01484 911 912 or visit our Website to find out more about our online SMS portal and business text messaging services. Posted on January 21, 2013, in Market Industry and tagged advertising material, communication, inbound enquiries, Keyword, leaflets, marketing material, Promotions, Shortcode, SMS Marketing, SMS mobile loyalty program. Bookmark the permalink. 1 Comment. Reblogged this on SMileS SMS.